Leaving the side patio awning exposed could lead to damage from the sun & other outside elements. Likewise, having to replace the fabric due to too much damage can become expensive. This Awning Pro-Tech Patio Awning Cover is designed to protect a rolled up awning by deflecting the sun and staying resistant to the weather. 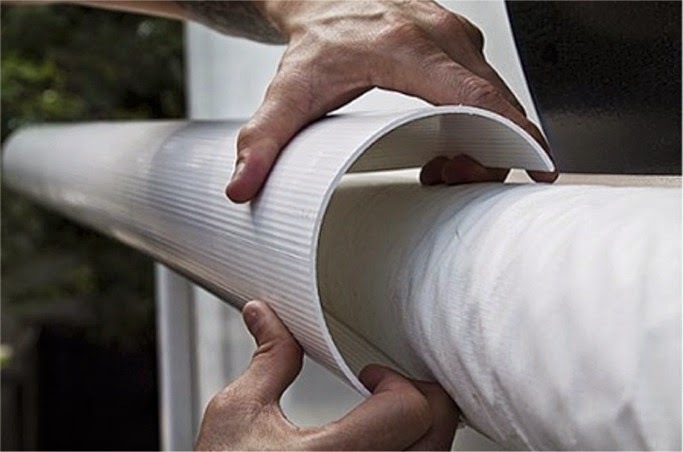 It does not take long to install, and is made from durable materials. The cover comes in a kit of 5 pieces that can accommodate 16-20 foot lengths. Clips come with the kit hold the cover in place while your RV is in motion. When installed correctly, it will present a tight fit around the awning to keep it protected. The pieces simply fit around the awning, and are designed to overlap each other so there are no gaps left in between them. This also saves you from having to cut the pieces to fit the length. When not in use, the pieces can slide together to make them easier to store. Depending on the length of your awning, not all the pieces may be required during installation. Your awning can be extended with the cover in place, as the pieces will loosen for removal. Remember to remove the clips before extending the awning. Your awning will need to be rolled up completely before putting the cover back on. Also keep in mind that full size RV covers should not be used in conjunction with this awning cover. The Awning Pro-Tech can extend the life of your patio awning and keep you from having to make a costly replacement.